This is a brillant funny advertisement that was displayed on the Metro in Washington, D.C.
"If I burn the evidence, those donuts never happened." 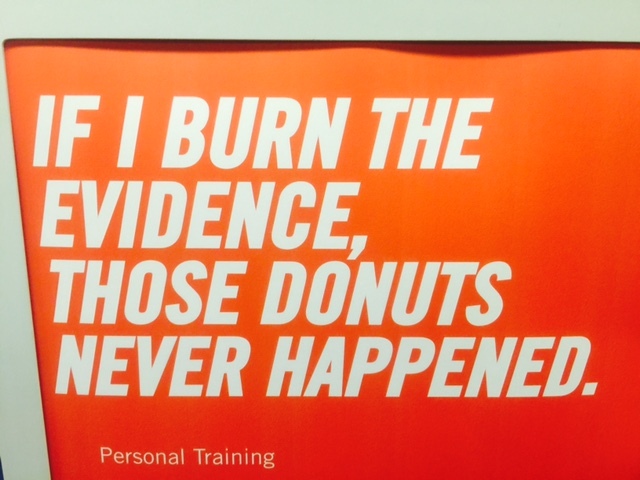 This as astute marketing for a fitness facility. Burn baby, burn (calories that is)! But in Washington, D.C. (and at times for fiduicary duty bound Wall Street), where transparency is supposed to rule the day--but often doesn't as we know--this resonates in a whole other way for a class of political and wealthy elites as well as for a host of criminals. Bad things (fraud, waste, abuse, and stupid mistakes)--uh, they never happened if there is no evidence to prove it. Like the tree that falls in the woods that no one hears...it's as if it never fell. Also, is there a habit of perhaps punishing the innocent in order to protect those that are really guilty? -- That never happens too, right? But G-d knows what really happened, and often somehow, someway the truth does get exposed (whether by savy investigative journalists, Congressional or court inquiry, brave innocents that come forward, or some bad people getting caught up in their own jumble of lies and deceit). As Judge Judy says, "If it doesn't make sense, it's usually not true."